Doyle was sworn in on January 10, 2013 as Commissioner of the Federal Maritime Commission. All told, Doyle has over 20 years of experience in the transportation industry, including both the maritime and energy sectors and has held several senior executive positions. These include an executive role as the Director of Permits, Scheduling, and Compliance with the Office of the Federal Coordinator for Alaska Natural Gas Transportation Projects. There, he managed and directed the permitting and regulatory coordination of 24 federal agencies, numerous State of Alaska agencies, and both federal and provincial agencies of Canada. A 1992 graduate of the Massachusetts Maritime Academy, Doyle’s career path has taken him to sea as a marine engineer, into the shipyard and eventually, to law school. Doyle served over a decade as a merchant officer aboard numerous classes of vessels and he also spent as MEBA Deputy General Counsel, Director of Government & Legislative Affairs and later became Chief-of-Staff. Of interest to energy stakeholders, Doyle, in a previous life, has served as Representative on the U.S. delegation for the United States on the bilateral trade delegation for the U.S. – Canada Energy Consultative Mechanism meetings, bilateral energy trade issue talks intended to strengthen the largest bilateral energy relationship in the world. Beyond that, he represented the U.S. in the annual coordination meeting between the U.S. Pipeline and Hazardous Materials Safety Administration and Canada’s National Energy Board. And, he was selected by the U.S. Department of State to participate in an international shale gas workshop to assess international resources, supply options, and market conditions. The Commission’s Bureau of Certification and Licensing (BCL) is responsible for Passenger Vessel Certification. The BCL includes the Office of Passenger Vessels and Information Processing (OPVIP). OPVIP receives and reviews applications from passenger vessel operators (PVOs) for Certificates (Performance) and Certificates (Casualty) and the associated coverage evidencing acceptable forms of financial responsibility. In this case, the Certificate (Performance) indicates that the PVO has filed acceptable evidence of financial responsibility with the Commission. The coverage is used to reimburse passengers when the PVO fails to perform cruises as contracted and has taken no further actions to refund passengers. The Certificate (Casualty) indicates that the PVO has filed acceptable evidence of financial responsibility with the Commission which can be used to pay claims for death or injury to passengers and other persons on voyages covered by the program. FMC’s history dates all the way back to its relationship with the U.S. Maritime Administration and subsequent separation. During World War I, Congress feared that collective liner pricing organizations (conferences) would use their market power to unreasonably raise rates or reduce services. Hence, the Federal Shipping Act of 1916 was enacted, thereby creating the United States Shipping Board. In those days, says Doyle, the United States Shipping Board and its immediate successor organization, the United States Maritime Commission, combined the roles of regulatory policeman and promoter. Later, the Merchant Marine Act charged the United States Shipping Board with monitoring and responding to foreign regulations that create conditions unfavorable to shipping in the foreign trade. In 1933, an executive order transferred the United States Shipping Board’s functions to the U.S. Shipping Board Bureau in the Department of Commerce. In 1936, Congress separated the Board from the Commerce Department, creating the United States Maritime Commission. Joseph P. Kennedy served as its first Chairman. In 1950, the regulatory programs of the United States Maritime Commission were transferred to the Federal Maritime Board at the Department of Commerce, where they resided until the FMC’s creation in 1961. And, in 1961, the performance of regulatory and promotional functions were separated, resulting in the formation of the U.S. Maritime Administration and the Federal Maritime Commission. Today, FMC works with the U.S. Department of Transportation and MARAD on the recently implemented Value Added Tax (VAT) by the People’s Republic of China (China). The issue pertaining to the VAT is whether there is any unfairness in application of the tax. For the past several years, the United States and China have held annual U.S. Bilateral Maritime Consultations. The FMC regulates ocean transportation intermediaries (also known as OTIs). The term OTI encompasses Ocean Freight Forwarders (OFFs) and Non-vessel Operating Common Carriers (NVOCCs). For many, these “brokers” or middlemen are the only parties with which they will interact in moving goods. Doyle insists that businesses should only use FMC- licensed ocean transportation intermediaries for their movements. He adds, “Concurrent with licensed participants, there are unlicensed, rogue operators out there. These are the bad actors, if you will.” To help the shipping public, Doyle explains, the FMC posts a list of licensed OTIs on its website where one can search by a company’s name or by a location. There are approximately 4,000 licensed OTIs in the United States. U.S.-based companies or sole proprietors operating as either an OFFs or NVOCCs are required to obtain a license from the FMC. Non-U.S. based NVOCCs are not required to, but they may obtain an FMC-issued license. 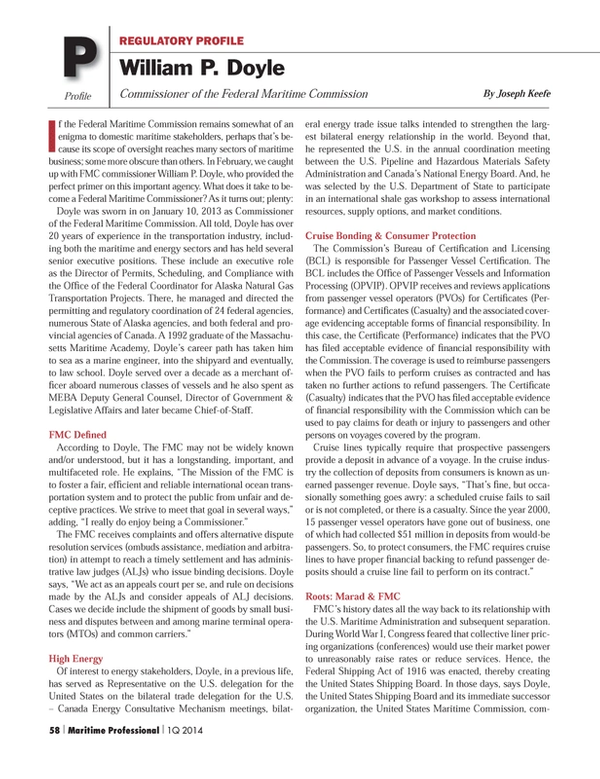 Doyle adds, “The general difference between OFFs and NVOCCs is that an NVOCC acts as the carrier of the cargo being sent.” The Commission is currently reviewing comments as a result of an advanced notice of proposed rulemaking that could affect OTIs, with the ultimate goal of balancing the needs of consumers with those of the industry. The Commission’s Area Representatives also participate in investigations of potential violations of the Shipping Act and Commission regulations, working with Bureau of Enforcement (BOE), which is the prosecutorial arm of the Commission. BOE attorneys also negotiate settlements and informal compromises of civil penalties, and may act as investigative offices in formal fact-finding investigations. During the first 10 months of 2013, the FMC completed seven compromise agreements from companies that violated the Shipping Act. The recovery totaled of $617,500 in civil penalties. The alleged violations include providing service that was not in accordance with the rates or charges contained in their tariffs, failure to be properly bonded and falsifying cargo declarations related to service contracts. Vessel sharing agreements and proposed carrier alliances are another area of FMC oversight. Under the Shipping Act, carriers are allowed limited antitrust immunity. The FMC is currently considering what the trade-press has dubbed “mega alliances” involving the world’s top International container lines interested in expanding or forming vessel sharing arrangements. In reviewing agreements filed with the FMC, the Commission’s regulatory role is to determine whether the agreement is likely, by a reduction in competition, to produce an unreasonable decrease in transportation service or an unreasonable increase in transportation cost. In December of 2013, the Commission reached compromise agreements with two international-flag car carriers with penalties totaling $2.3 Million. The carriers were found to have acted in concert with other ocean common carriers with respect to the shipment of automobiles and other motorized vehicles by car carrier vessels, where such agreement(s) had not been filed with the Commission or become effective under the Shipping Act. Commission staff alleged that these practices persisted over a period of several years and involved numerous U.S. international trade lanes.